It starts in Defenders #104, in which not a lot happens except for an interlude in which Nighthawk, Hellcat, Valkyrie, and Gargoyle get captured by the black ops governmental organization the Central Information Bureau, led by August Masters. This organization also appeared in issue #102. Eventually, we learn it’s the rebirth of the Secret Empire, and that August Masters is just impersonating a Federal agent. It’s been a simmering thread for a few issues. Captain America #268 picks up the kidnapping thread, which means we all get the joy of seeing Mike Zeck draw The Defenders. It’s a little strange to have a crossover like this with no cross-promotion. Normally, Jim Shooter did everything he could to be the next Stan Lee, and Stan would never have let an opportunity like that go by. Anyway, Cap manages to free The Defenders, but in the end, he and the team give themselves back up to August Masters when he threatens to kill a whole bunch of innocent hostages–except for Nighthawk, who eludes re-capture and sends a psychic distress signal to Dr. Strange, who heads out to the rescue with Son of Satan, Beast, and Daredevil (who were together in Defenders #105). Yeah, this is a Mark Gruenwald joint, which means it ties together tons of loose threads. In order to escape the CIB base, Nighthawk stays behind–in his wheelchair–to run a self-destruct sequence. He dies in the blast (presumably), and, on her way off the base, Valkyrie is shot in the back. She, too, dies. It’s a strange way for her die–so random. I love this picture because of the feet. They’re so awkward and splayed–it really looks like she’s been shot. It’s not a “death pose.” I don’t usually see this kind of “unglamorous” treatment of death in comics. And we’re only halfway done with this story! Immediately, there’s a funeral and some guest show up. Silver Surfer wasn’t turning up in too many places, so it was cool to see him. Anyway, Valkyrie’s soul has to go through some Asgardian mystical stuff, and Enchantress shows up. This leads directly into the next story. It’s really two separate ones, but they weave together tightly with no break so I’m covering them both here. 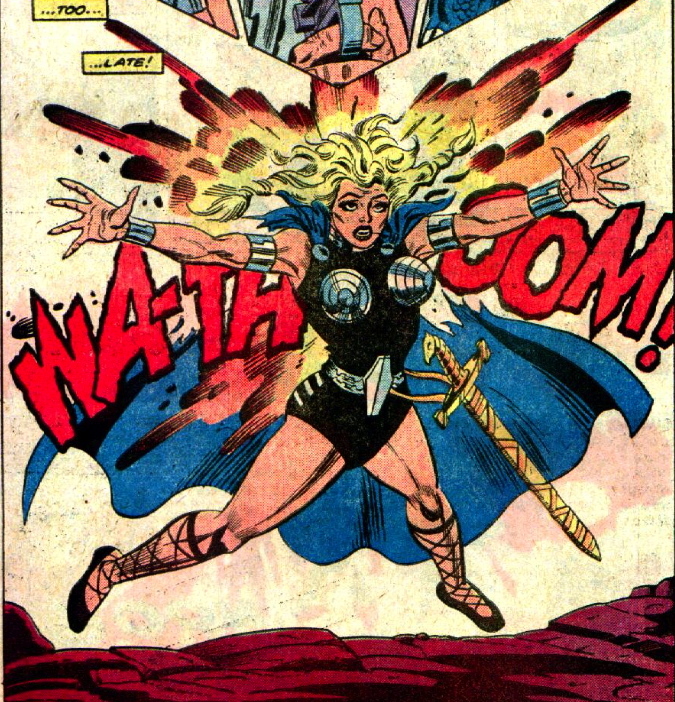 We learn that the woman who died was Valkyrie’s spirit, but not her actual body, which is being held by Enchantress. This enables JM DeMatteis to disentangle Valkyrie from Barbara Norris’ body and spirit, and basically reboot the character. With a new costume. Then, at the end of #109, Nighthawk, too, returns–also with a new costume! This seems like a cliffhanger, but issue #110 does nothing to resolve it. Nor does #111. In issue #112, we learn that this is the Nighthawk from Squadron Supreme (Earth-S), who for some reason got teleported to Earth 616 when Kyle Richmond died. Interesting to see two characters essentially replaced by other versions of themselves.